This will likely be my last post on Mark Driscoll for a while. As one who has critiqued him, called to stop making fun of him, and in a recent post, called him a cautionary tale, this feels like an appropriate time to close this loop for a while. If you haven’t heard, earlier this week Mark willfully resigned from being the lead pastor of Mars Hill Church. It’s been a big deal for some of us for a while and you can read up on the details here and elsewhere but there’s been a significant abuse of power, a series of inappropriate actions and years of inappropriate conduct. It’s customary to blame the media. “They’re always trying to get the public riled up about something!” Despite the hype (and there will always be hype), there is often good reason for the concern. The Ebola outbreak is real. The World Health Organization reports there have been 4,493 deaths while others estimate the number to be closer to 12,000. Today’s reports are filled with the two nurses’ travel and current care as they treated the Dallas man who died after his trip to West Africa. And like all disease, this is tragic and worth grieving. 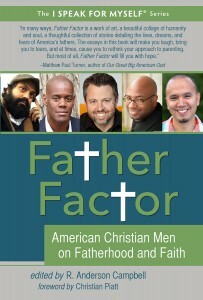 I’m so grateful to announce that I have a chapter in a book that will be released next week: Father Factor: American Christian Men on Fatherhood and Faith published by White Cloud Press. It’s Book 5 of the amazing I Speak For Myself Series. Father Factor explores the intersection between faith and fatherhood, probing the resonance and dissonance created when men examine fatherhood in all its permutations, and how it is informed by and informs their faith. There are a wide variety of Christian faith perspectives represented in the book and many ethnicities. The contributors include ministers, professors, a real estate agent, an actor, nonprofit leaders, stay-at-home dads, and a call center representative, from locations as far apart as Honolulu, HI, to Paris and all points in between. They each have a compelling story about faith and fatherhood. Fatherhood is quite the complicated subject for all of us. For obvious reasons it transcends culture, generation, social class, and more. Biologically, we all have a father, but the relationship we have with that man differs for each of us. And so it took quite a number of voices to speak into such an important, complicated and potentially painful/beautiful subject. I’m in a season of life where many of the people I have known and loved throughout my life have gone from talking about the realities concerning their fathers to actually now being a father. I find it really interesting to contrast the conversations we had at 15 about our dads and now about being one (and now what we think about our dads). Interesting times. From what I’ve been able to access, our idea of fatherhood is changing constantly. Among other sentiments, we may feel unprepared but when we see our children, we wouldn’t pass this opportunity to father for anything. I’ve been seeing from my fellow contributors that we’re all trying to find some clarity on the amazing calling of fatherhood. My chapter is entitled, “Fatherhood Has Changed You” which is a comment one of my friends from seminary said to me. I was a bit surprised by her observation and found myself spending most of my two hour drive thinking about how the last two years had changed me. Infertility and long unanswered nights filled with hurt, angst and what felt like futile prayers were quickly replaced by two healthy, happy, crying boys that got us up in the middle of the night and got us out of bed early in the morning. Only fatherhood (and motherhood) can understand the incredible beauty of this. One of my favorite aspects of the project is being included with some pretty amazing writers/bloggers/thinkers like main author and project editor, Anderson Campbell, Christian Piatt who wrote the foreword, a new book called Post Christian and writes one of the most provocative blogs you can read), Jason Boyett (Author of many titles including O Me of Little Faith), Andrew Marin (Love Is an Orientation), Micah Murray of Redemption Pictures, Steve Knight and friends of mine like Daniel Haugh and Drew Hart. Here’s the full list of contributors and the short bios. A HUGE special thanks to our main author/project editor – Andy Campbell. He brought so much goodness together. And grateful for our publisher Steve Scholl and the good people of White Cloud Press. To share as candidly as possible – I’m really grateful and proud to be a part of this. There is so much to be gained in the conversation of fatherhood and I’m honored to contribute to it. So I hope you consider picking up a copy, liking our Facebook page, and spreading the word. Should We Still Love/Watch the NFL? For those who are already disinterested or dislike the NFL, it’s easy to see all the recent events as yet another reason to turn off the NFL. But what do real NFL fans do with what’s happening these days? Confession: I like(d) Ray Rice and Adrian Peterson. “Mighty Mouse” and “All Day” have been great athletes to watch play football. Further, up until now, their off-the-field personalities have been likable. Yeah, Rice has always been cocky but it’s “little-guy in the NFL syndrome” and it works. And though AP preaches a different type of Christian faith than I do, I did appreciate that he trusted Jesus and desired to share his hope with others (Did you see him “preach” at the ESPY’s last year?). So when news broke out that Rice knocked out his then-fiancé and the images of him dragging out Janay, I was very saddened. Like many, I balked at the two-game suspension Roger Goodell gave and when the video in the elevator was released, wow! I along with everyone could not believe what I saw (I don’t doubt he lives in deep regret of that moment too). Then when the news of Adrian Peterson broke of him beating his four year old in the manner he admits to, my stomach turned again. The pictures and the report are enough, though however unlikely, I hope no video ever emerges of the look of Peterson’s face as he did what he did to his young son. These high-profile incidents and many others are making us all wonder what is going on, how much is enough and what can actually be done? What does it mean to keep watching/following/cheering? What does it mean to stop? How does this correlate to every other scandal in the entertainment industry, the political sector, the church world, and all the missteps that my friends and family members make in my own private world? There’s the big picture view of society, the closer ones, and the one in the mirror – what about him/her? And for those of us Christians, how does our faith inform this? 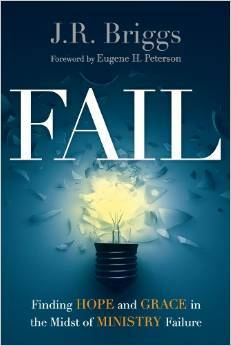 One of the books I read this summer was called Fail: Finding Hope and Grace in the Midst of Ministry Failure by J.R Briggs. I still need to write my review of how much I enjoyed this book but failure, success and the fears and trappings connected and everything in between is always on my mind – and likely on yours too. It’s safe to make the assumption that everyone has felt the fear of failure at some point. For many of us, it’s a relevant, in and out thing. Maybe right now you are doing exactly what you want to be doing, maybe you’re doing the opposite, whatever and wherever, the fear of failure always lurks. On good days, we know we will experience failure and success and we’ll live and learn. On the not so great days, we over-fixate, we grieve the loss of something prized, we let it consume and we let it spill-over in other aspects of our lives. I’m sure you have read countless quotes on failure and have read numerous insights about overcoming it. For us ministry types not following the liturgical church calendar, these are a different type of intense days as the new church ministry year begins. The over-all vision has been worked on and prayed on for months, the supporting themes/ministries need to move from ideation to practice and among the many other pieces to move into motion, there is the volunteer search (Please read last year’s post “There Aren’t Enough Volunteers This Year and There Never Will Be”). In addition to all that, there is still the need and your own personal desire to meet with people in the hopes of listening, counseling and serving. As you know, no one goes into the ministry because they love Excel and calendaring. It can be easy to lose track of the original reason of serving others during this ramp up as often you hear the phrase “Here we go again” with a sarcastic grin. I’ve heard it and said this countless times over the years and it feels like a statement worth unpacking. “Here we go again” is likely asked by a broad spectrum of people in a variety of contexts. In the church world, staff, lay-leaders, and volunteers of all kinds. On Sunday Pastor Mark Driscoll announced to his Mars Hill congregation that he will be stepping back for six weeks as the elders examine the charges against Mark and determine the appropriate next steps. It’s hard for me not to see this as a good thing as I’ve discussed him on this blog a few times and he’s come up in countless conversations over the years. Too much has gone on for too long and Mark needs to be held accountable. Being a pastor and in this space, an amateur blogger, I know how this can look. I’m another kicking a guy when he’s down, another example of the church eating their own and clearly motivated by jealousy, etc. I am also well aware of Jesus’ warning of judging others as you will be judged by the same measure (Matt 7:1-2). May the Lord judge my heart here but I hope to communicate as “Christianly” as possible of where I am coming from. It’s actually healthy to talk about this in loving and restorative ways. It’s not only ok, it’s actually necessary because this scene in Mark Driscoll’s life is a cautionary tale for all of us. Further, hopefully some goodness can be found in the mess of all this. And lastly, should the day come when my personal behavior has become such a distraction to the Christian mission, I hope my faith community would be courageous enough to ask me to step down. May God give the Church the wisdom to discern between judging, rebuking and enabling. In the meantime, here are three lessons learned. I echo the words and spirit of John Perkins when he was interviewed by Christianity Today. “As Christians, we know that our problem always is sin. In the case of the shooting in Ferguson, I don’t know who is right because I don’t know who initiated this. But I know that the sin of racism, which goes back to the sin of enslavement, is what makes it escalate so quickly.” (I encourage you to read the rest of the piece, remains among the most helpful of the week). After reading, I too wondered about the Christian response to the death of Michael Brown. After a few days of reflection, here’s where I am today: Lament – Pray – Listen to What the Lord Leads You to Do Next. I lament the death of Michael Brown and all that it represents. I lament for Officer Darren Wilson. I lament for what will get lost in the moment. I lament the sin of racism. I lament all the pain that everyone in Ferguson is going through. I lament that so many throughout our country and our world can relate to this scene. I lament all the stories this connects us to: violence towards minorities, violence towards law enforcement, violence in between, blatant racism, abuses of authority, intentional criminal behavior and the carnage this leaves behind. I lament that there is so much to lament. When you start adding up all the laments, you find yourself a bit irrational. I am sure everyone, especially those involved, wish they could go back in time and somehow take action to avoid this tragic scene. Another loss of life, a lot of damage that is either nearly or completely irreparable. Some will say that we can learn from this so it never happens again but unfortunately, that’s part of the irrationality. Part of the pain of these laments goes beyond regret but also found in the mourning of a terrible reality that a similar scene will happen again. Israel, Gaza, Isis, Iraq and all things Middle East are on many of our minds these days. In respect to the Israeli-Palestianian conflict, we often ask, “Why is this conflict so complicated ? Among the reasons is its long history and each party telling its own version of it. We also know Iraq carries with its own complication. While the moral atrocities conducted by Isis are obviously evil, we again find the long-term solution to be weighty. Today we see a persecution that is bordering on holocaust that must be stopped. The Middle East is certainly a topic that punishes you emotionally the more you read and learn. Sheer brutality, beheadings, sexual violence, children used as shields, missiles fired from churches, broken cease-fires, the perception of no mercy and brutal retaliation, and countless human rights abuses leave us extremely angry and frustrated. What is going on here? How do we stop it? How can we make things better? How can do it now? Easy questions to ask, extremely difficult to answer and deliver. Our anger takes another step forward. What most of us want is to understand what’s what. When you don’t have access to the classified information and lack the power to mobilize an army or a peace delegation to stop the pain one way or another, you just feel powerless. In the meantime, we try to read/scan/pick through all the content. There’s a lot of rehash, a lot of bias, and personally, I find more frustration. Frankly, I don’t really know what’s going on, there’s a lot of eye-witness accounts, a lot of opinion – some much better than others. There are images taken from other scenes and used for support, and all these other “snapshots” that don’t quite fill out the big picture. I even find some of the good guys and villains switching roles and it’s difficult to figure out who we can trust.Then because no one really knows, we attach the word “allegedly” to everything. Then like with everything, there’s our own bias and perspective. This informs not just our starting points but our potential emotional investments, among other things. We could continue comparing perspectives but the point really is everyone has a different one. Further, no one can or should assume too much of the other perspective. Like we said, it’s complicated. Today, I’m feeling practical, strategic and spiritual and frankly, none of this seems that complicated. They may not lead to the short-term results we want today, but if enough people did them, it feels like things would change for the better.